Raith Rovers FC is proud to reveal its unique new away strip. It is a complete break from our traditional team colours but is nevertheless dedicated to the Club’s proud history and the sacrifice its players made during the Great War, the centenary of which is being remembered this year. In 1914, Sir George McCrae raised a battalion of sportsmen to fight for King and country in World War 1. Seven Raith Rovers players (James H Logan, George McLay, Willie Porter, Willie Lavery, Jimmy Todd, Jimmy Scott and Jock Rattray) joined up, along with a group of players of Heart of Midlothian FC and several other clubs. The battalion, the 16th Royal Scots, took part in actions including the Battle of the Somme and the push for Passchendaele, and three of our players (Todd, Scott and McLay) paid the ultimate sacrifice. 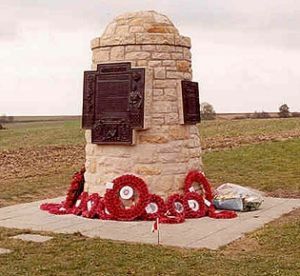 At Contalmaison, in northern France, a memorial cairn for McCrae’s Battalion was erected in 2004 (pictured below). Ten other Raith Rovers players also enlisted for service in other regiments during the Great War. This special commemorative shirt, in the colours of the Hunting Stewart tartan worn by the Royal Scots Regiment, marks the centenary of the formation of McCrae’s Battalion and Raith Rovers FC’s links with it. It honours all those who have served in our Armed Forces in conflicts since. On the chest, there will be a poignant one word message and a tribute to McCrae’s Battalion. Our friends in sport, Heart of Midlothian FC, led the way, both in the formation of that battalion and, alongside the McCrae’s Battalion Trust, in establishing memorials both in Edinburgh and Northern France. Now we, at Raith Rovers, will signify our pride and our gratitude by this generation of our players proudly wearing these colours. The new away strip should be available in the Spring, hopefully in good time for summer holidays. We hope our supporters – and maybe even a wider audience than normal – will be proud to wear the colours of the McCrae’s Battalion.